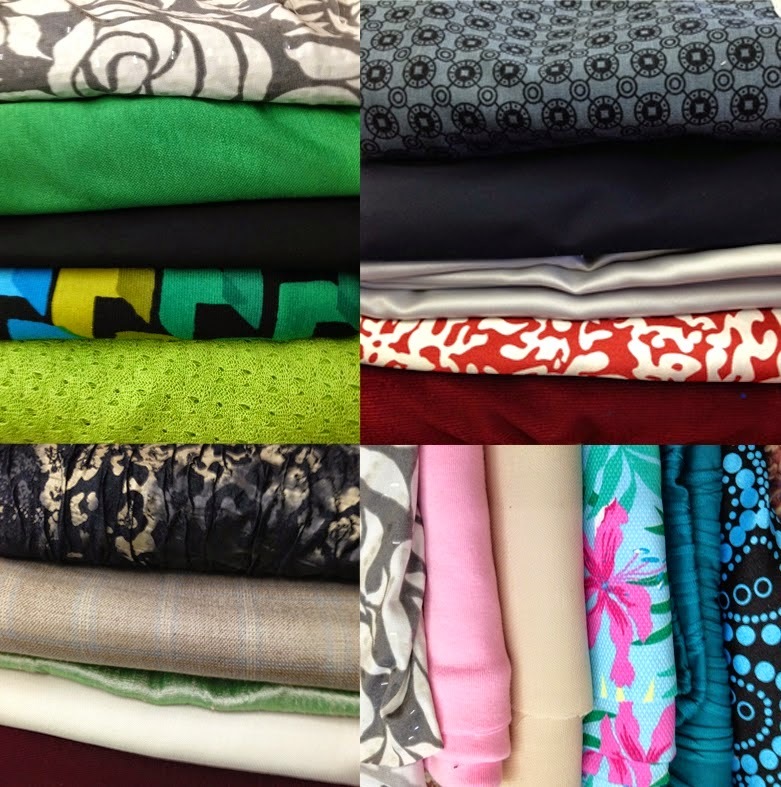 Fabric Mart Fabricistas: 5th Challenge: Mystery Fabric Bundle - What They Made! 5th Challenge: Mystery Fabric Bundle - What They Made! This week's challenge is a day late, because I was out of town at a trade show all week and didn't have access to a computer! So this week viewers will have Thursday and Friday to judge for their favorite! The winner will be announced this Saturday! To recap, this week's challenge was to create a 2-piece garment out of a fabric bundle I provided them. This is also the second to last challenge before the BIG one, so the last three going into the next challenge will win something. 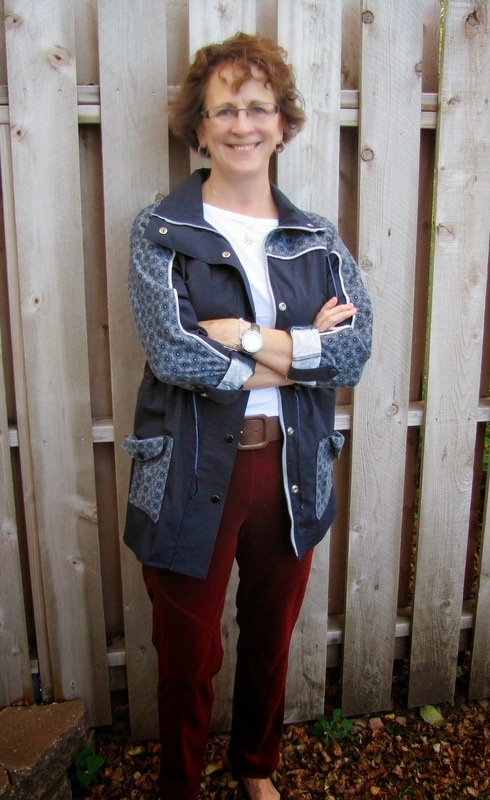 This week's judge is Marcy Tilton, a renowned pattern designer and world traveler! You can check out her website here. Getting a mystery bundle is lot like playing cards- a bit of a gamble, but lots of fun! 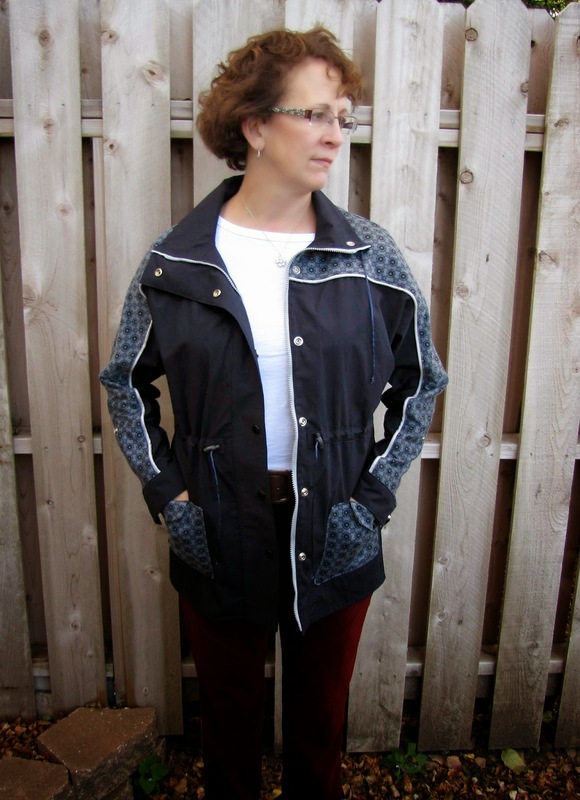 In my bundle for this challenge, I had one wild card- a beige wool gabardine. One of the other fabrics in my bundle was a floral satin that I knew would make a great lining, so I decided to try to dye the wool to pick up the blue in the satin. This was my first attempt at dyeing fabric, so I researched, tested different formulas, and finally came up with the perfect mix of royal blue and aquamarine dye for the weight of wool that I had. After dyeing, I had just under two yards of wool- just enough for a great short jacket. I used McCalls pattern 6294 which had a triangular insert in the back. My dyed wool had some parts that were more variegated than others, and I decided to feature the most variegated piece in the triangular insert. The wool was quite fluid, so I interfaced all of the pieces to give it more body. For the other part of my outfit, I decided to mix two knits- a ruffly jade green knit and a large white/gray floral with plastic sequins. My pattern was Hot Patterns 1144, Deco Vibe Sarine Dress which has a skirt overlay that tucks into the waistband. I only had one yard of the green knit, so it got used as the top portion. A piece of black swimwear fabric from my stash worked as a waistband to transition into the floral knit. Because of the plastic sequins, I chose a raw edge hem finish on the skirt sections. Had I not been participating in this challenge, I would have never thought of putting these fabrics together. But, I think it works! I love blues and greens and feel that this is a modern mix of colors that is "me". I can wear the dress alone or with the jacket, and the jacket will be wearable with many other items in my wardrobe, as well. 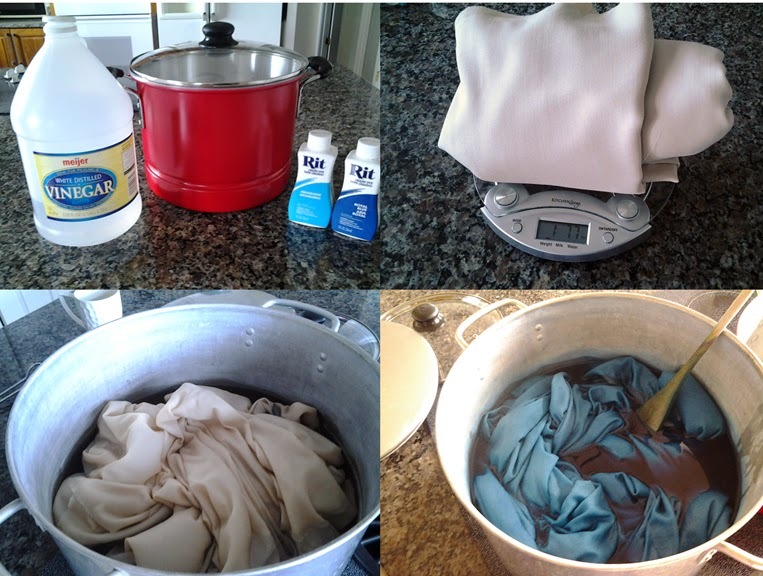 I'm excited that I branched out to try dyeing fabric, and will definitely be using this technique in the future (as well as ordering more mystery bundles)! The top is Butterick 5922, and I decided to do a long version of view A. I used the white wool as the collar (even though it specified stretch knits only, the collar was fine in a woven), the animal print crinkle knit as the back piece (which I placed on a fold instead of having a center back seam), the reverse of the animal print crinkle knit (black nylon) for the sleeves, and the maroon horizontal rib knit for the front piece. I love how it looks. Though I am not one for colorblocking, and prefer my animal prints either abstract or classic 60s (think traditional leopard prints), this combo worked, and the front especially reminds me A LOT of Boden, they do tops like this quite frequently. Johnnie hasn't lost his job providing me with their cute clothing, but it was kind of thrilling to know I made a pretty good dupe (even if it has a bit of a "party" going on in back). My hubby loves the front look, but can't get past the animal print, even though it is in his beloved Saints colors, black and gold. I think I will wear it when he is watching the Saints play and if they score a touchdown, I will run into the room and yell, "the animal print did it, the print!" The pants are McCall's 6711. I like pants that have pockets, and a zip in the back, with a minimal waistband, since I rarely tuck in my blouses or tops. I am very high-waisted and sometimes front zips and buttons hurt when I sit down. Anyhow, I was thrilled to see these would work for me, as the crotch curve is identical to a pair of Burda shorts I have made multiple times that fit me well. I don't anticipate that all McCall's pants are like that, but these, yes! I used the gorgeous wool plaid for the pants, alone, since I liked the idea of having a very traditional item with one less so up top. My husband really likes these. And because I love the fabric so much (even though it gave me fits while cutting it, grrr), I knew I wanted to spend the time ensuring the plaids matched up precisely and that the pants had a proper lining (made from a blue lightweight cotton). The time and energy was worth it. They feel so so good on...and remind me a lot of some RTW J. Crew pants that I have, but dang it be all, don't fit properly anymore. I was the lucky recipient of bundle #1! I received a grey/white faux sequin knit, a kelly green dazzle knit, a poly/cotton broadcloth in black, a light/mid printed ponte and a bright green sweater knit. I knew the grey/white fabric was out because I just couldn't make it "go" with any combo of the others in my head. So I set about creating an outfit from the remaining 4. I had an entire different look initially (deets on the blog!) and ended up ‘scrapping' that plan...and sewing a new look from my scraps!!! So, I wanted a weekend, running errands sort of outfit and for fall in my neck of the woods, that means a jacket and pants. And, on the weekend I want comfort! 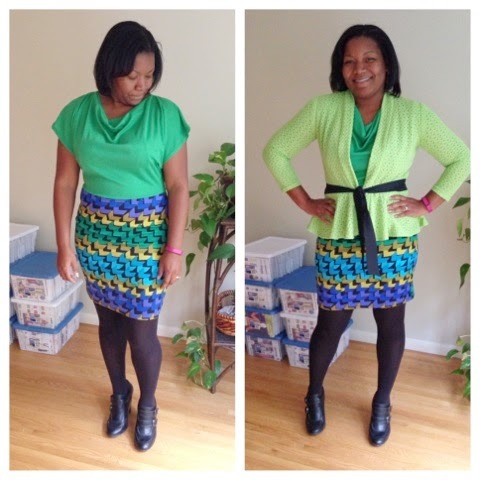 So after rifling through my pattern stash, I found two winners that make up my outfit. 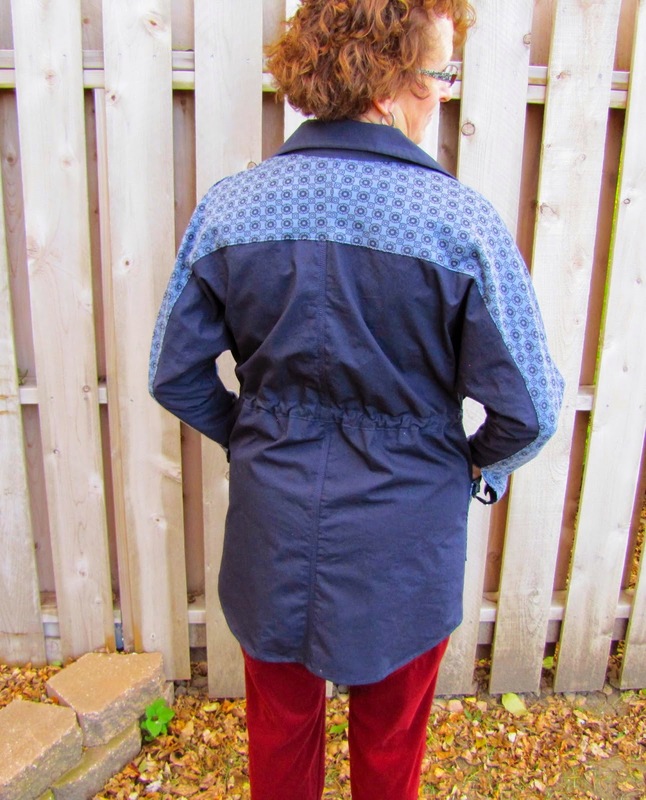 So, I hope you can tell which fabrics I used where! The challenge stated you had to use the majority of the chosen fabrics for your garments. Well...I am proud to say I ONLY used the fabrics provided! Nothing from my stash was used...at all! Two of the fabrics used on the jacket are pretty obvious. One that may not be as noticeable is the gray satin that I used as the piping on the jacket. So, I successfully used four of five fabrics only on these two garments! For my jacket, I wanted to make more of a layering piece rather than a full out jacket for cool days. 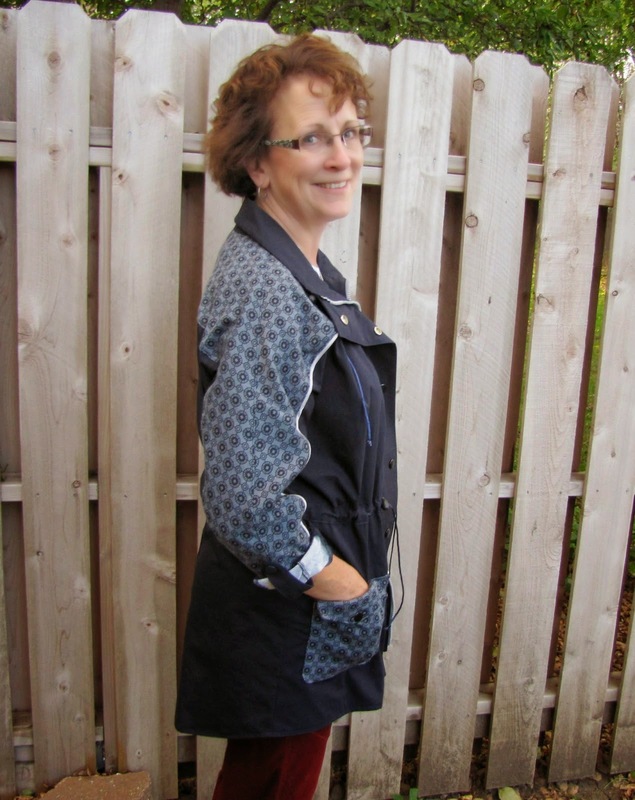 The piping was my own addition and I thought the touch of the gray pulled the two fabrics together and accentuated the gray zipper. Let's talk about those awesome details! Is this the most RTW jacket you've ever seen? It is for me! I had so much fun with adding the snaps, topstitching, cords, and stoppers. 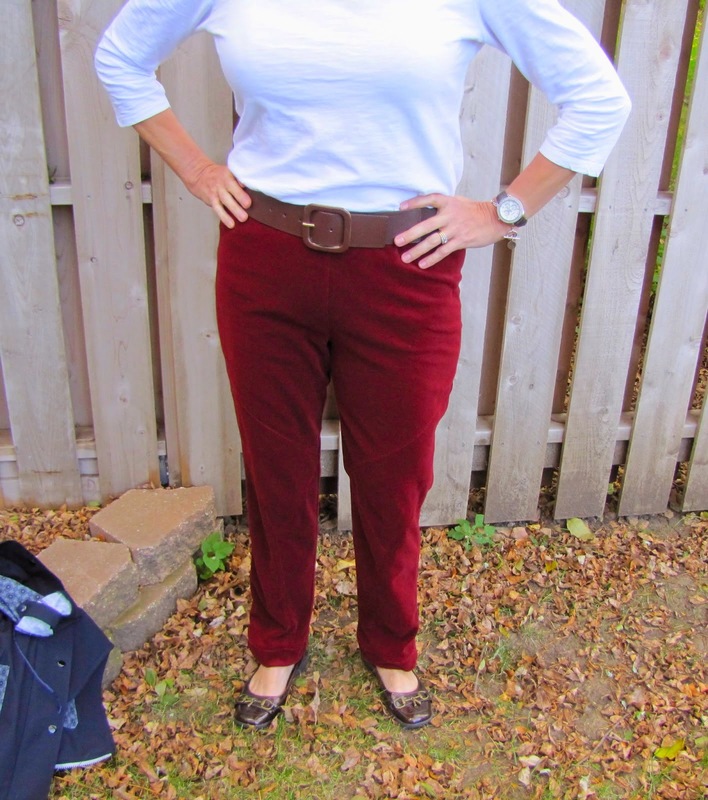 Now for the pants...I wanted super comfy but stylish pants to run errands in and Vogue 1411 was the perfect choice! 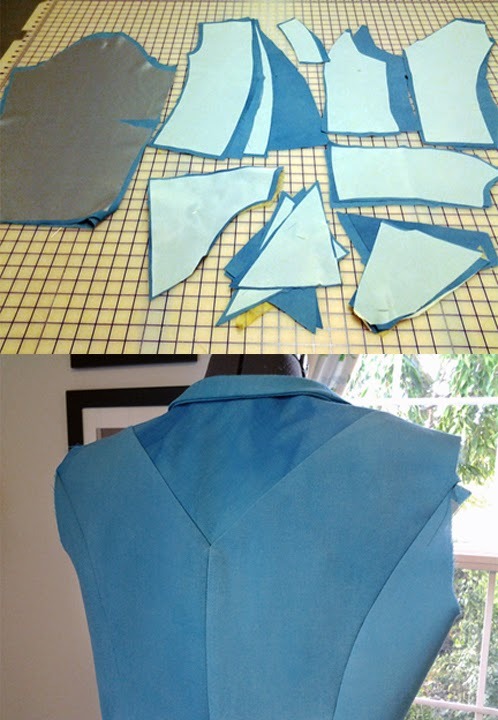 This pattern came together fairly fast--even with all the topstitching! They fit well, are super comfortable, and dressier than your average leggings. I see many more of these in my future! Check out my freaking awesome topstitching and how it matches at the outer leg! I am very pleased with my new outfit. I can't wait for the weekend to test it out! I'm torn... I'm don't know who to vote for this week :) Another week of great work!!!! Everyone here has got game! Hard to pick. I cannot figure out who I would vote for! Every one of these is amazing! All I can say is Wow! Amazing talented women, I love Dina! Wish I could vote for BOTH Nakisha and Sue!